Pair of Georgian Pendeloque Paste Earrings. Photo Courtesy of Christie’s. Pendeloque earrings, c. 1770’s were designed with a round or marquise-shaped top suspending a bow motif from which dangles a drop with a design complementary to the top. These earrings could be quite elongated in opposition to the tall coiffures popular at the time. 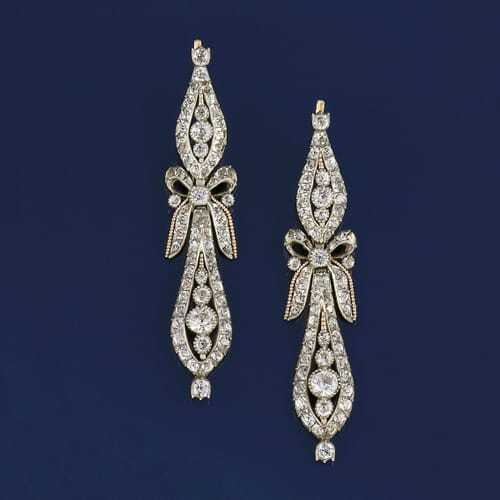 This style was the evolutionary predecessor of the two stone earring, which features a smaller stone suspending a larger one, that has remained popular throughout history. The contemporary definition of pendeloque has come to mean a pear-shaped dangling ornament.